You can run a manual Windows update on your laptop to help keep it updated. This is always recommended because it will help protect your computer from the latest viruses and malware. 1Press Win+I and click Change PC Settings. The PC Setting window will appear. 2In the PC Settings window, click Update & Recovery. 3In the resulting window, click the Check Now link. This will show you all updates. 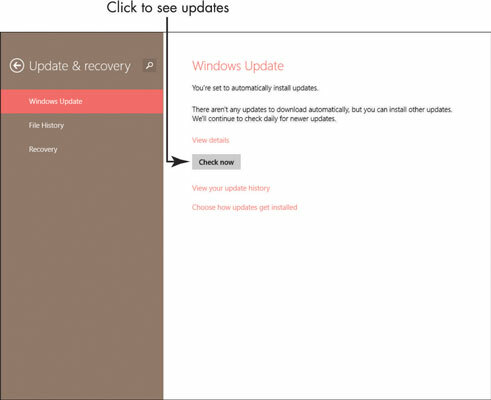 4In the following window, which shows the available updates, click to select available critical or optional updates that you want to install. Then click the Install button. 5A window appears, showing the progress of your installation. When the installation is complete, you might get a message telling you that it’s a good idea to restart your computer to complete the installation. Click Restart Now. You can make settings for Windows Update by clicking the Choose How Updates Get Installed link. If you leave the setting for Windows Update to Never Check for Updates, it’s very important that you perform a manual update on a regular basis. Running Windows Update on a regular basis — either automatically or manually — ensures that you get the latest security updates to the operating system. It’s a good idea to stay current with those updates to avoid the latest threats.